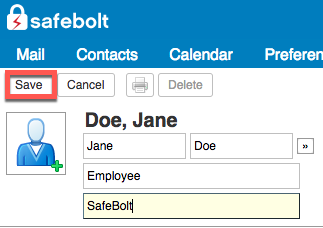 In order to add a contact to your SafeBolt address book, first click on the "Contacts" tab from the menu bar. Then click on the blue "New Contact" button. Enter your contact's information, and click "Save" at the top left corner. 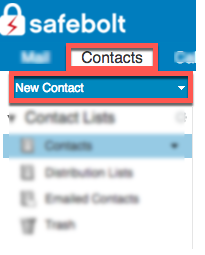 To search for contacts, again click on the "Contacts" tab. Type your search into the search bar in the top right, and click the search icon to the right of the text box.